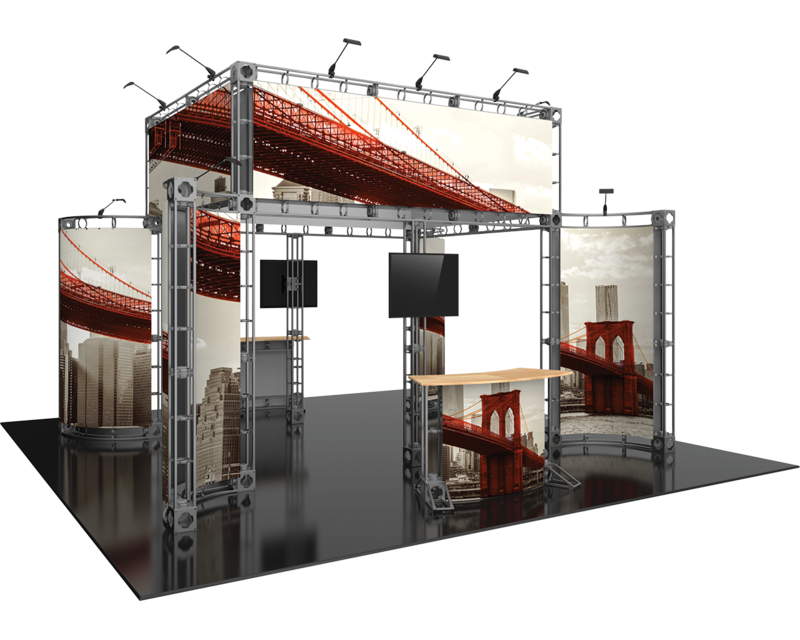 Classic construction and industrial styling have made the Truss system a contender in the trade show exhibit market for years. Contact us for custom needs. Dominate the show floor with the bold, industrial look of the tool­less Orbital Express System. 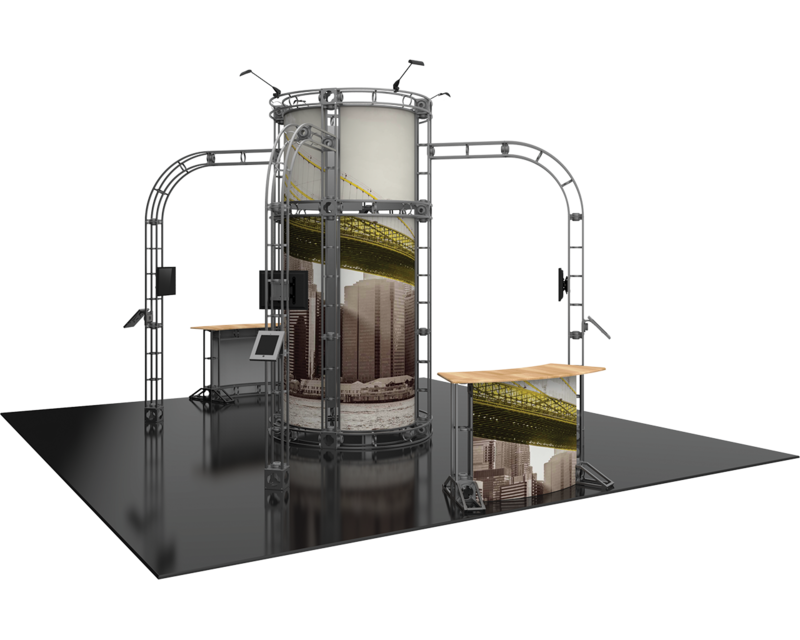 The Atlas 20x20 trade show exhibit features media-ready monitor mounts, counters, circular tower, and a center discovery feature that can double as a semi-private meeting space. Dominate the show floor with the bold, industrial look of the tool­less Orbital Express System. 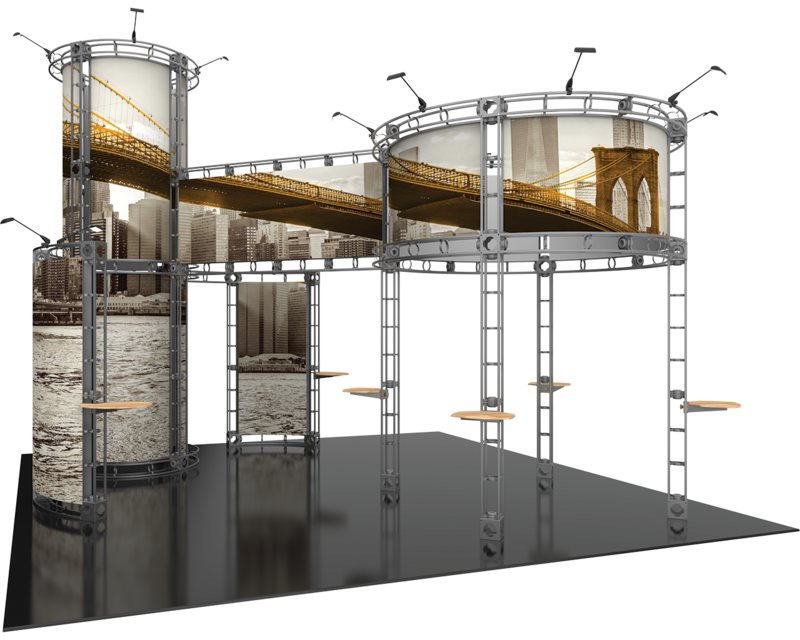 The Corvus 20x20 trade show exhibit features numerous counter shelves, two distinct circular towers, and overhangs. Additional customization available. Dominate the show floor with the bold, industrial look of the tool­less Orbital Express System. 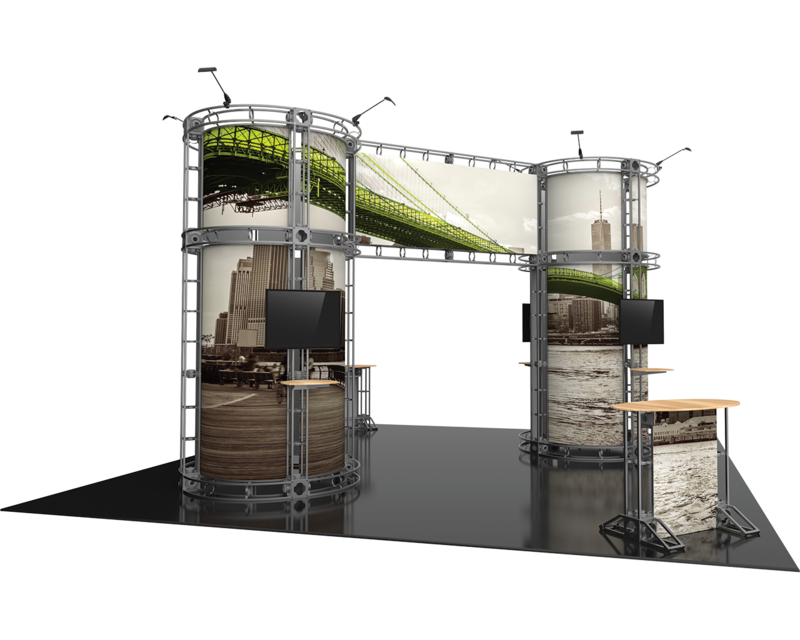 The Aarhus 20x20 trade show exhibit features two media-ready monitor mounts, two stand-alone info counters, and square center overhang. Additional customization available. Dominate the show floor with the bold, industrial look of the tool­less Orbital Express System. 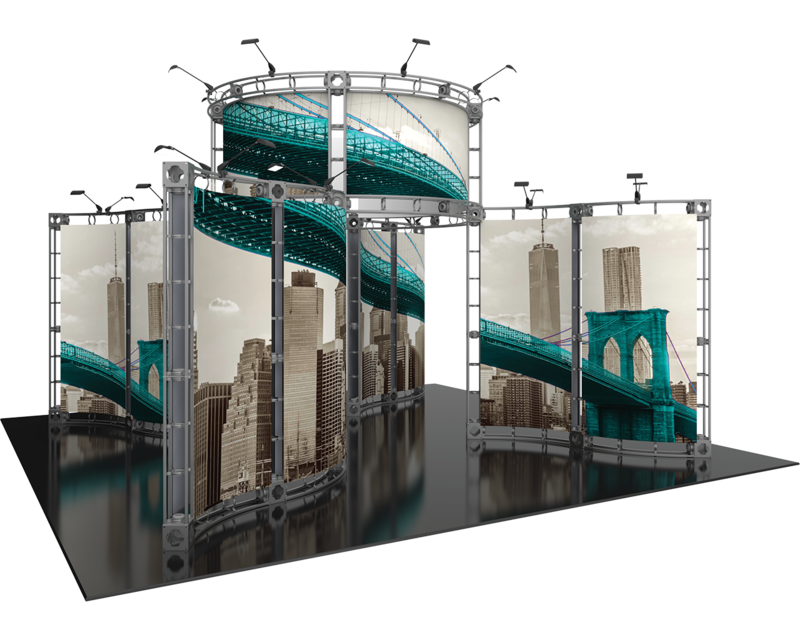 The Gemini 20x20 trade show exhibit features a bold two tower design with a distinctive banner graphic bridge, two stand-alone info counters, multiple media-ready monitor mounts, and shelves. Dominate the show floor with the bold, industrial look of the tool­less Orbital Express System. 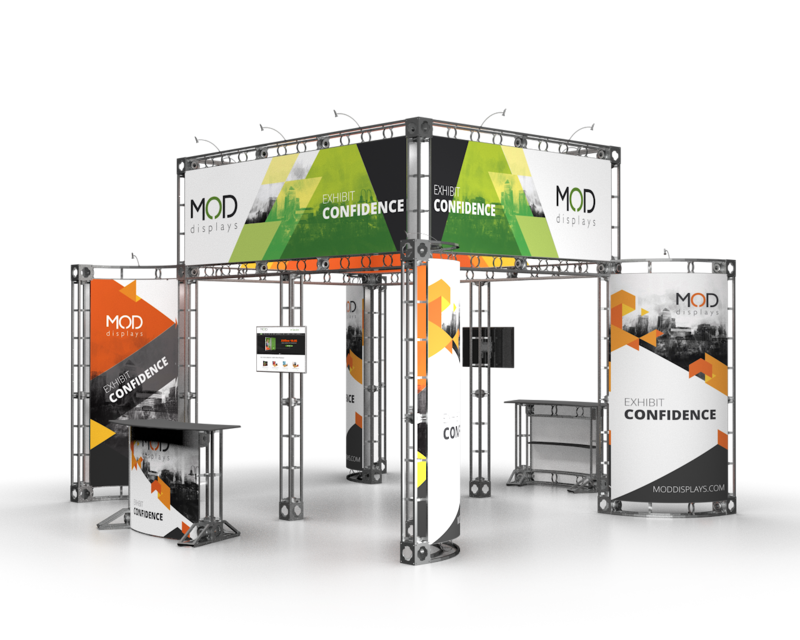 The Canis 20x20 trade show exhibit features an inventive layout with ample panel graphics, and a center discovery center. Additional customization available. Dominate the show floor with the bold, industrial look of the tool­less Orbital Express System. 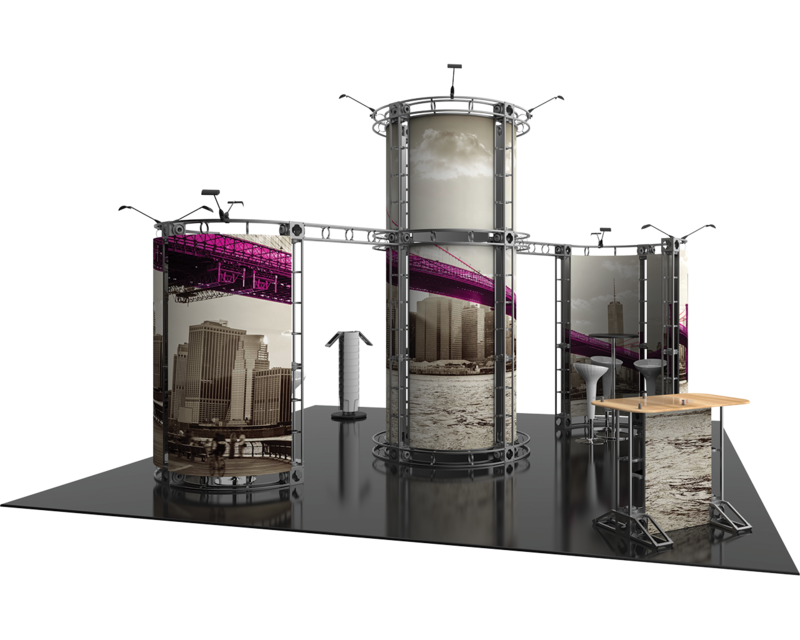 The Zenit 20x20 trade show exhibit features an open layout highlighted by a trio of towers with info counters, literature stand, kiosks and more. Additional customization available. Dominate the trade show floor with the bold, industrial look of the tool­less Orbital Express System. The Vesta 20x20 trade show exhibit features two info counters, media-ready tv/monitor mounts, ipad kiosks, center tower, and more. Additional customization available. Orbital Truss designs bring a 'wow' factor. The industrial styling makes this an ideal choice for a range of businesses, and provides a flexible investment due to its highly scaleable framework. The frame goes together like an Erector Set using twist-and-lock connectors to piece together the steel truss sections that can be customized into an endless amount of configurations. Pre-designed kits provide options in a variety of booth features. 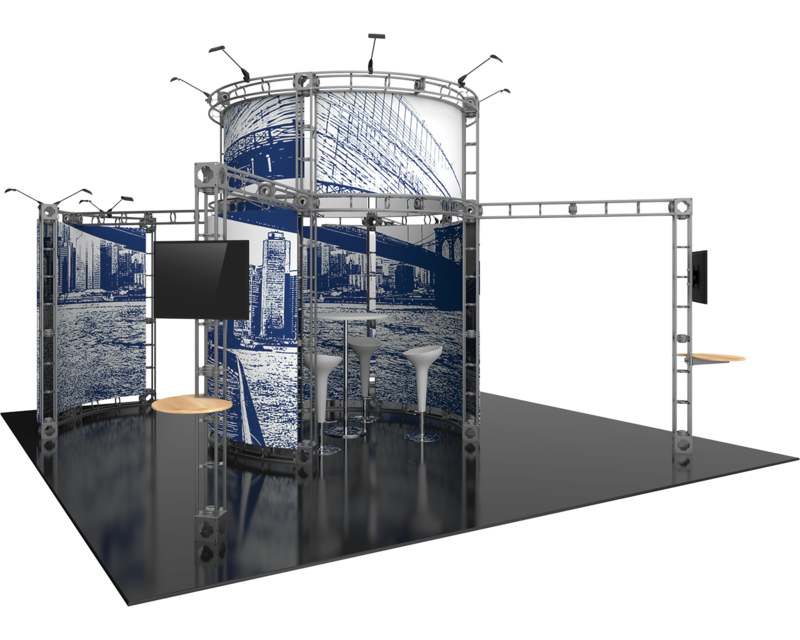 We can assist in customizing the layouts further based on your trade show strategy. Multiple custom-printed panels and headers allow for personally branded displays. Many accessory add-ons such as shelves, literature racks, monitor mounts, extra lighting, and more.